This past spring, I took a cruise to South America. It was a very exciting trip because it followed the travel of Darwin and Magellan through the southernmost part of that continent. After leaving Buenos Aires the ship headed south to Patagonia making several stops along the way. Much native wildlife was seen along the way. It wasn’t until we cross Cape Horn and cruised to Chile through the Fiords that we came upon an island in Magallanes and Antarctica Chile dedicated as a penguin preserve home to over 20,000 penguins. This is where my inspiration came from to create my latest sculpture Magellanic Penguin. A friend of mine gave me a block of aerated concrete a while back and this was the medium I used to carve the sculpture. The material was quite delicate and it could only be carved with files. 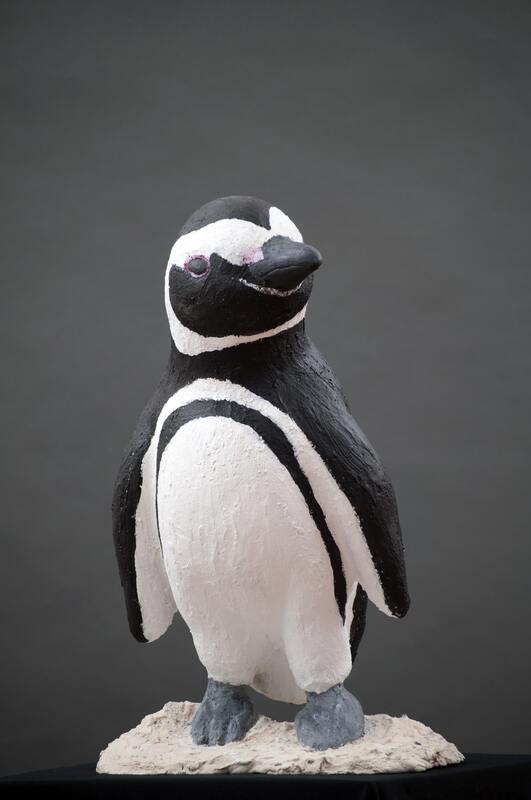 After I finished the sculpture I coated with cement stucco and painted it to resemble the penguins I encountered on that island. The sculpture will be on exhibition at the Naples Art Association’s annual non-juried exhibit. Please come by and see the exhibition.